Sol and Nechuma Kurc are proud of their family. Their five children are beginning to marry and start families of their own. But the Kurcs live in Poland in 1939 and their lives are about to change in ways they cannot fathom. Sol and Nechuma keep their heads down in the Polish ghetto while their son Addy tries to escape Europe, their daughter Halina works for the resistance, and their daughter Mila desperately tries to protect her young child. 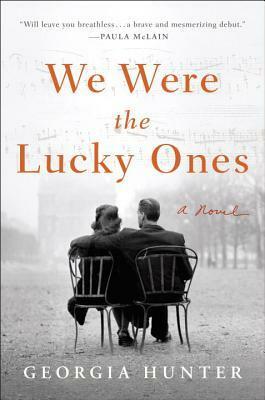 We Were the Lucky Ones is a story that crosses continents and generations to provide a unique and heartbreaking story of the cruelty and devastation of World War II. I read a lot of books set in this time period. This kind of historical fiction has to do something extra special to draw me in. This time, I read rave reviews all around and as it turns out, they were right. Hunter does an excellent job of showing the very different experiences that Jews had during that time. It also covers a greater span of time than most of these stories, since it begins in March of 1939 and goes through the spring of 1947 as people emerge from the literal rubble of Europe and try to find their family. Each chapter begins with a brief overview of what was happening in the war so the reader understands what is about to happen, even if the characters do not yet. Some reviewers say that the characters are not fully developed here, but I think the missing component is the opportunity for preference. The characters here have no choice other than survival and there is no place for us as the readers to know someone's favorite food or the thing that drives them crazy because living for another day takes everything these people have. We do get a bit more development from Nechuma, the matriarch and Addy, one of the sons who is in France at the beginning of the war. Nechuma can show us who she was during an entire lifetime and Addy has the security to fall in or out of love and think about the music he wants to compose. Ms. Hunter has not deprived us of robust characters; rather, she reveals just how much focus is required to survive when every choice could be the last one. As a young woman, Georgia Hunter discovered that her family survived the Holocaust as Jews in Poland. She interviewed her surviving relatives and began to piece together what they done and where they had been. Hunter admits that there were some things she could not find, so this story is part family history and part fictional account. Whether each event is fact or fiction, the vein that runs through this story is just how quickly everything can change; for these characters and for victims of modern wars, there is no such thing as safety in a war zone. If you are a reader who enjoys books set in this era or just enjoys a carefully told story about family, We Were the Lucky Ones is a book you must read. Once you meet a mother determined to see her son again, a wife who will give everything to break out her husband, and a husband storming a fortress for the safety of his family, you will never forget them. This sounds my kind of read. Thanks for the review. Like you, I've read enough historical fiction set in this time period that it takes something special to get me excited to pick up another one. I'm glad to hear that this one lived up to the hype for you! It does sound unique.